Thomas Jordan grew up in Minneapolis, Minnesota with his brothers Jim and Dan and parents Jack and Dorothy. As a boy, his Mom and Dad recognized his creative artistic talents and gave him a constant stream of encouragement and support. So much so that after graduating from high school, Tom was accepted to the Minneapolis College Of Art and Design where he obtained a Bachelor Degree of Fine Arts. 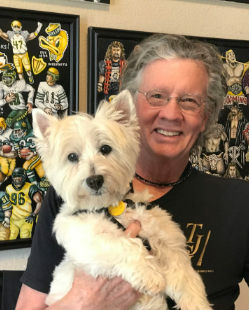 After a successful 30-year career in apparel retail and wholesale, Tom now resides in Texas and Minnesota with his wife Karen, where he is blessed with the opportunity to express his passion for oil painting while creating paintings that people enjoy. "With all the creative high and low tech options people have to select art for their homes and places of business, it gives me a great sense of satisfaction that I can create an oil painting in my style that pleases them enough to want to own it."